The holiday season is still in full swing, so the dangers to pets are still present as the festivities continue through to the New Year. Holiday activities that are normal for humans, such as traveling, out-of-town visitors, etc. 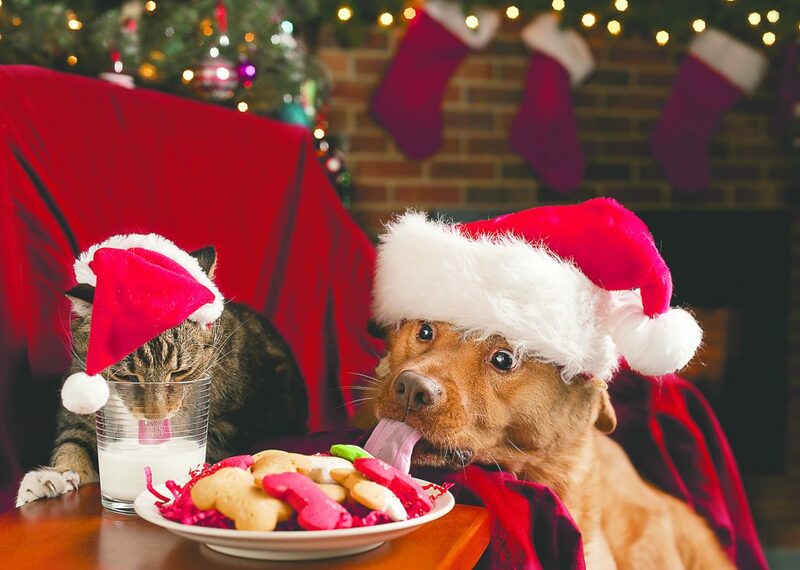 can cause us to overlook simple things in our lives that can be threatening to our furry friends – things such as leftovers, decorations, or even holiday plants can be a danger to our pets. Who doesn’t love leftovers? I know I do, and I know my pets have been smelling and drooling since I brought it into the house. While we’re taught to share at a young age, you do not want to share leftovers with your pets because they can be harmful or even toxic. Fatty trimmings, which can cause pancreatitis, and bones, which may result in stomach perforation, are big “no-no’s”. Grapes/raisins, onions, garlic, and avocados all can cause lethargy, lack of appetite, and even vomiting. While cookies and candy aren’t exactly the healthiest for humans, they are even worse for animals! These foods can cause severe illnesses in pets. If you haven’t heard about Xylitol, a natural sugar substitute found in most diet foods and gum, and even in some everyday foods and beauty products, be sure to remember the name because this product, which is absolutely healthy for humans, is fatal for your pet. Don’t forget about all of those adult beverages we so enjoy from now through the New Year. Alcohol is something that is extremely harmful for your pets. We make drinks that are fruity or filled with creams and other deliciousness, and your pets may like the taste as much as we do, so keep them out of reach. When you avoid giving these foods to your furry family, both you and your pets will enjoy a much happier and healthier holiday. When you are done with the meals and drinks, make sure to throw them away, right away, and even get those trash bags outside in a securely sealed garbage can. Believe me, they can get into just about any trash bag that smells of all those scraps! Decorations are one of the best parts of the holidays because everyone gets to show off their holiday traditions. Trees are trimmed, lights are strung, and the tinsel is sitting just right… or at least until the cat wakes up. While there isn’t a single pet that wouldn’t look adorable propped up next to the Christmas tree, don’t let them stay there long. Tinsel, ribbon, and other similar decorations are played with and often ingested, causing intestinal obstruction and lacerations to their digestive tract. Ornaments are also a hazard to your pets. A lot of us think of our pets as children, so decorate your tree/house as you would if you had a small, curious child roaming around. 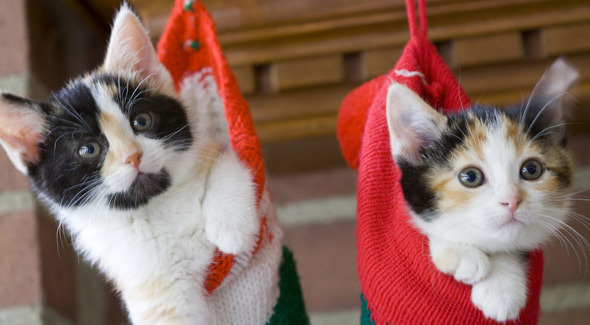 Place ornaments on higher branches and make sure stockings cannot be pulled down easily. Another danger is electric cords which are fun for pets to chew on, putting them at danger for electric shock. You can learn from my mistake. I followed my own advice and placed the tree and cords out of reach of my puppy. But did you know a cord has a tag, which puppies enjoy yanking on? I do now! After a huge crash and multiple games of chase to get ornaments out of the puppy’s mouth, the tree is now safely sitting on an even higher table, not plugged in, out of reach from a curious puppy. While you might have managed to get through the actual holiday without a mess, don’t let your guard down before you take the decorations down. 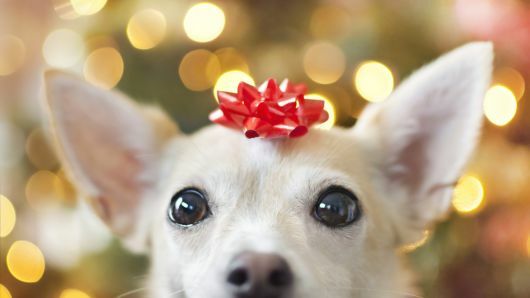 Did you know holiday plants can be incredibly toxic to your pets? While mistletoe might be something you’re looking forward to during those last few holiday parties, this plant can be toxic if the wrong species gets a hold of it. You also might want to second guess the halls you’ve decked with boughs of holly because this plant is also incredibly toxic to your furry friends. Finally, one of the most common holiday plants is also something your pets need to avoid, poinsettias. Poinsettias can cause irritation, vomiting, diarrhea, and even heart arrhythmia in both cats and dogs. All three of these plants are beautiful holiday traditions, but it is best to avoid having them in your home for the safety of your pets. While Christmas seems to overshadow New Year’s Eve when it comes to our furry friends, there are still hazards we need to keep in mind. New Year’s Eve is one big celebration as we ring in the new year, but to our pets, it’s a lot of new noise and commotion going on. 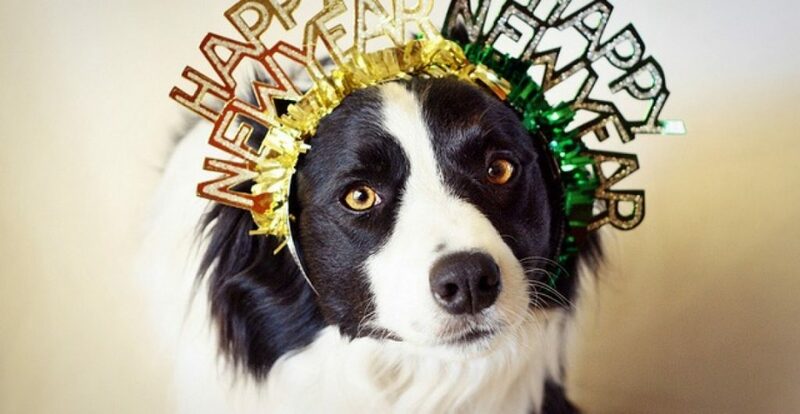 New Year’s festivities often include lots of noise makers and loud voices, so be sure that your pet is indoors and in a quiet place where they can get away from the human celebration These loud noises can send your pets into panic mode which can result in them getting lost. Try to create a calm environment for them somewhere in your house away from all of the commotion where they’ll feel safe and relaxed. Adding things such as their favorite toy, blanket, or even an article of your clothing so your scent is there with them can help soothe them in this stressful time. Also, keeping your furry friends indoors will lessen the chance of them panicking and running away if there are fireworks present. 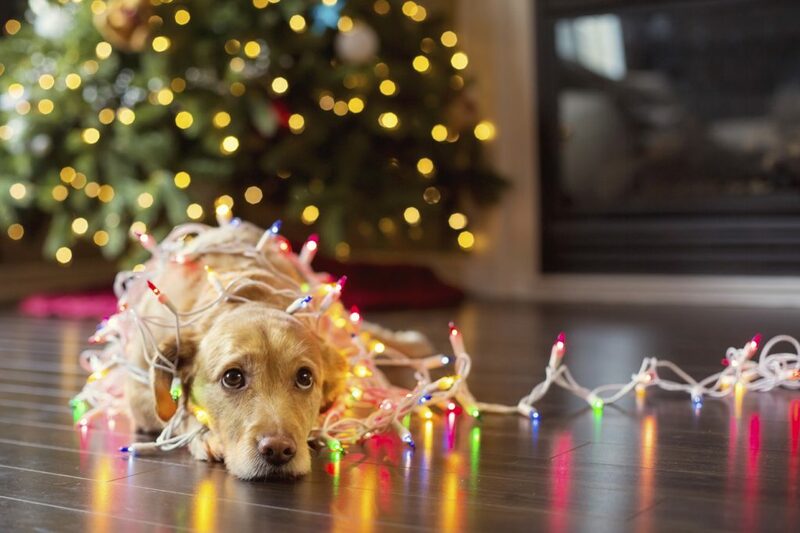 There is always a chance your pet could still get lost even if you follow all of my advice, I mean just look back at my Christmas tree failure I talked about earlier, so make sure their identification is up-to-date. Microchips are wonderful because if your pet ends up at the pound, they can scan the chip and let you know your pet is safe and waiting for you to come get them. I have it marked on my calendar to make sure my dogs’ chips are updated because I want to make sure I do everything I can to keep them safe. New Year’s Eve is also a time where a lot of people have a drink to celebrate. While there’s nothing wrong with this, please make sure all alcoholic beverages stay out of reach of pets. Our furry friend’s kidneys were not meant to filter or process alcohol content like we can. Also, our pets usually are a lot smaller than we are which means it only takes a little bit for them to feel the effects. Don’t feel bad about celebrating on New Year’s Eve because it is a joyous time, just make sure you’ve prepared your pets for the night. While this topic may not feel like we are spreading holiday cheer, keeping your pets safe over the entire holiday season will help your holidays stay happy and cheerful. Things to remember: not everyone can digest those delicious holiday leftovers like us humans can; holiday decorations are beautiful to look at, but they are also a danger to curious animal minds; and while mistletoe, holly, and poinsettias are wonderful to have in the house as decorations, they are toxic to our furry friends. Enjoy the last bits of the holidays while keeping the peace of mind knowing you’re keeping your furry family safe.